Why did Herbert Lehman not get an honary degree? I do think Ephdom has a problem with excessive decorem. Perhaps considerable decorem is necessary to get faculty particiapation in this blog. I only hope the faculty will allow a little more controversy than they find really comfortable. Some will, and some won’t. Williams once did have a candidate with deep beliefs, Herbert Lehman, who ran for the US Senate in New York and was elected several times on very liberal platforms. And his family gave Williams lots of money. But, Williams was so offended by his brashness and liberal beliefs that it never even gave him an honorary degree. True story? There is a great history thesis to be written about Williams and the Lehman family. Who will write it? Who’s the best public speaker at Williams College? It’s a contentious question, but regardless of whom you ask, Professor Steven Fix’s name is likely to be in the mix. Among his colleagues, he is known for timing his lectures down to the second— literally. He once told a beginning English professor, “That was an excellent lecture, but you’re running twenty-three seconds too long.” Among his students, Fix is known for delivering such moving lectures as to reduce students to tears, even when those lectures concern authors as obscure as Samuel Johnson—one of his personal favorites. Besides his speaking engagements in the English department, Fix is also the college’s Phi Beta Kappa Chapter Historian, and it falls to him to deliver the history of the Society at Williams each year, on the day before graduation. So, on June 7, 2014, Professor Fix delivered a rousing rendition of the history of Phi Beta Kappa, much to the delight of the audience who, having been awakened for the 8:30 a.m. event, needed some rousing. “The history of Phi Beta Kappa at Williams is a history filled with jealousy, intrigue, suspicion, and, alternately, triumph!” Fix began, intoning dramatically. The audience laughed along with him, but as his speech continued, it became clear that the history of Phi Beta Kappa at Williams actually was filled with all of those things and more, focused centrally around an educational rivalry between the two oldest colleges in Massachusetts—Harvard and Williams. In all seriousness, though, Phi Beta Kappa was originally formed as a secret society at Williams and Mary, and it had all the attractions of one—rites of initiation, secret signs known only to members, and lots of swearing of oaths. Today, Phi Beta Kappa retains all of these features. However, the initiation is a public one, the sign of membership is the well-known key, and there is but one oath of loyalty, not to a fraternity, but to philosophy—to the love learning and wisdom. Clearly, the mission of Phi Beta Kappa has changed drastically since its inception. “So I suppose you’re all safe,” Fix said. “At any rate, William and Mary, as the original location of Phi Beta Kappa, was vested with the power to establish new chapters, and the college chose to bestow chapters upon Harvard and Yale, along with the power to approve or veto new charters for schools in their respective states,” Fix said. And that’s where the drama really took off and how it came to be that despite being the second-oldest college in Massachusetts, Williams was the 17th chapter of Phi Beta Kappa to be established. And so it was that Williams’ founding was delayed until 1792, when the trustees of Williams College struck back at the overseers of Harvard. The Williams trustees petitioned the colonial government for a charter on the grounds that Williamstown, being an “enclosed place,” would not expose students to the kind of “temptations and allurements peculiar to seaport towns [e.g. Boston].” Williamstown was cast as an institution that would civilize the frontier and turn out moral citizens—something that held great weight for a government that was terrified by the news of rebel uprisings, as in the French Revolution and Shay’s Rebellion. Perhaps unsurprisingly, the relationship between Williams and Harvard remained prickly after Williams obtained its school charter. Recall now that Harvard controlled which Massachusetts colleges could have Phi Beta Kappa chapters, so in order to found a chapter at Williams College, Williams had to send Harvard an application. Harvard responded predictably—issuing a pocket veto, refusing to vote one way or another, and thereby leaving Williams to wait indefinitely. Eventually, though, in 1833, the stalemate was broken. Williams’ then-president, Ed Griffin told two students to go over the New York-Massachusetts border to Union College [in Albany, NY] to ask them for a charter instead. Union College replied that they didn’t have the authority to establish a chapter of Phi Beta Kappa outside of their own state, but they could issue other charters, so the Williams students came home with a charter to start a fraternity called “Kappa Alpha.” “The president saw ‘Kappa’ on a piece of paper and heartily congratulated the students on their success,” Fix reported. But inevitably, the difference was realized, and in 1861, Williams tried again to found a chapter of Phi Beta Kappa, reopening negotiations with Harvard. Finally, Harvard relented. “And as the Civil War raged, a society founded in the Revolutionary War had its inauguration at Williams College,” said Fix. “So remember that Williams College struggled to have a chapter of Phi Beta Kappa, and honor that struggle by taking seriously your commitment to a lifelong love of philosophy,” Fix said, finishing at exactly twenty minutes, on the dot, to resounding applause. Fleshing out that history would make for a great senior thesis. Who will write it? Tenth (and final!) installment in our two-week discussion of the recent New York Times article “Generation Later, Poor Are Still Rare at Elite Colleges” by Richard Perez-Pena. Interested readers should check out our collection of posts about socio-economic issues related to admissions, from which I have plagiarized extensively. In order to bring a little historical context to this discussion, I was digging through the Williams archives and came across this statement from an alumnus from the late 1800s. It must have been tough to have been a good Christian gentleman toward the end of the 19th century, to have been raised from birth to believe in the Gospel, and then to confront the scientific fact of evolution. Many, of course, could then (and today!) combine Christian Faith with a recognition of the reality of evolution. But, for any individual, the transition must have been jarring. Or you ready for a similar jarring? Consider this comment from the start of our series. Nothing like an umpteen-part discourse on how poor people are too genetically inferior to attend Williams to build good will for the relaunch of Ephblog! Many genomic elements in humans are associated with behavior, including educational attainment. In a genome-wide association study including more than 100,000 samples, Rietveld et al. (p. 1467, published online 30 May; see the Perspective by Flint and Munafò) looked for genes related to educational attainment in Caucasians. Small genetic effects at three loci appeared to impact educational attainment. We identify common genetic variants associated with cognitive performance using a two-stage approach, which we call the proxy-phenotype method. First, we conduct a genome-wide association study of educational attainment in a large sample (n = 106,736), which produces a set of 69 education-associated SNPs. Second, using independent samples (n = 24,189), we measure the association of these education-associated SNPs with cognitive performance. Three SNPs (rs1487441, rs7923609, and rs2721173) are significantly associated with cognitive performance after correction for multiple hypothesis testing. There are probably several thousand genes which, together, explain a large percentage of the variance in academic success, both in K-12 leading up to Williams and at Williams itself. Does that mean that people with the wrong settings for rs1487441 et al are genetically inferior? No! No more than my descendants are genetically inferior because they lack the (undiscovered) genes which help to explain basketball success. Yet the reality of genetic (partial) explanations of success and failure is as inevitable as the triumph of evolution in our understanding of human origins. And, as we identify these genes, we will soon discover that their distribution is not uniform, that some groups of people have more of these genetic advantages that cause (not just correlate!) with academic success and some groups of people have fewer. Prediction: Sample 1,000 rich people and 1,000 poor people in the US. Many more rich people than poor people will have the “preferred” settings for rs9320913 and friends. And that means that the more of the children of rich people than of poor people will have these same settings. And that will explain, at least partially, why there are more students at Williams from rich families than from poor families. You read it first at EphBlog. * OK, OK. I made up that quote about Apes. Sue me! Experts in Williams history can surely help me come up with something appropriate. 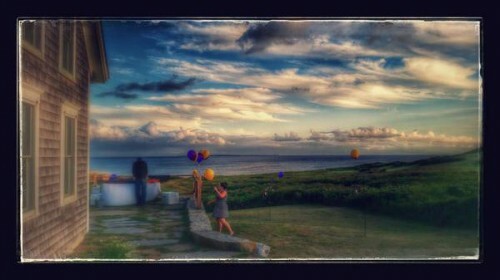 Or I could just go with something from Summer for the Gods . . .
Ninth installment in our two-week discussion of the recent New York Times article “Generation Later, Poor Are Still Rare at Elite Colleges” by Richard Perez-Pena. Interested readers should check out our collection of posts about socio-economic issues related to admissions, from which I have plagiarized extensively. Kids at the most selective colleges often struggle academically, but they are capable of doing the work. The real key is whether they feel comfortable going to professors to ask for help or teaming up with other students in study groups and to manage the workload. “Capable of doing the work” covers a lot of sins. The question is not: How capable is a poor student with 1300 Math/Reading SATs? With those scores, she is in the 90th percentile nationally. Very smart! But, at Williams (pdf), she is in the 20th (or maybe the 10th?) percentile in her class. Not so smart, at least compared to her classmates. And that is, potentially, OK. Someone has got to have the lowest SAT scores in the class. The key is whether or not Williams is honest with applicants about just what scores like that suggest about her likely future at Williams. Consider a concrete example: How many math majors at Williams have a Math SAT score at 650 or below? I bet that, round numbers, it is close to zero. But that means that, if she wants to be a math teacher someday, our hypothetical applicant would be much better off going to her state university (where she would be as smart as most of the math majors) than she would be going to Williams (where her odds of successfully completing the math major are very low). At the very least, Williams owes its applicants the truth about the reality of academic life at elite colleges. Bromides and tripe about how “capable” every is? Spare us the sanctimony. Consider simple question: The Williams 6-year graduation rate is 95%. Pretty good! But that is for the class as a whole. What is the 6-year graduation rate for a student with at Math/Reading SAT below 1200. You can bet that it is much worse than 95%. Call it 70%. Is it really such a tragedy if such students decide to go to a school at which they will be academically well-matched with their peers? Eighth installment in a two week discussion of the recent New York Times article “Generation Later, Poor Are Still Rare at Elite Colleges” by Richard Perez-Pena. Interested readers should check out our collection of posts about socio-economic issues related to admissions, from which I have plagiarized extensively. And at a narrower, more elite group of 28 private colleges and universities, including all eight Ivy League members, researchers at Vassar and Williams Colleges found that from 2001 to 2009, a period of major increases in financial aid at those schools, enrollment of students from the bottom 40 percent of family incomes increased from just 10 percent to 11 percent. Even with the best intentions, tapping the pool of high-performing low-income students can be hard. Studies point to many reasons poorer students with good credentials do not apply to competitive colleges, like lack of encouragement at home and at school, thinking (correctly or not) that they cannot afford it or believing they would be out of place, academically or socially. First, let’s change the title of this article from “Generation Later, Poor Are Still Rare at Elite Colleges” to “Generation Later, Children of Short People Are Still Rare in the NBA.” Does that still seem surprising, or even problematic? Short people have, on average, short children. And being short dramatically decreases your odds of making the NBA. Of course, these (true) empirical claims are just averages. It is possible for short parents to have a tall child and/or for a short person to make it in the NBA. But no one should be surprised that it is rare. Similarly, poverty is correlated with lower intelligence and work ethic and these traits, like height, are partially genetic. So, it is hardly surprising that a child of poor parents is less likely than a child of rich parents to have the sort of academic credentials that Williams wants. When lower-income students start college, they often struggle to finish for many reasons, but social isolation and alienation can be big factors. But once those from lower socioeconomic backgrounds arrive on campus, it’s often the subtler things, the signifiers of who they are and where they come from, that cause the most trouble, challenging their very identity, comfort and right to be on that campus. The more elite the school, the wider that gap. To stay four years and graduate, students have to come to terms with the unspoken transaction: exchanging your old world for a new world, one that doesn’t seem to value where you came from. Being young, I didn’t understand, believing myself immune to the idea that any gain might entail a corresponding loss. I was keen to exchange my Western hardscrabble life for the chance to be a New York City middle-class museumgoer. I’ve paid a price in estrangement from my own people, but I was willing. Not every 18-year-old will make that same choice, especially when race is factored in as well as class. But how can we help our students prepare for the tug of war in their souls? We can be honest. The fact that Cappy Hill, Tony Marx, Morty Schapiro and the rest of the Cathedral are not honest with these students is the single most infuriating thing about socio-economic affirmative action. For example, consider a non-rich senior from an average high school with 1300 Reading/Math SATs. Such a student, before accepting an offer of admissions from Williams, would like to know his odds of graduating in 4 years. But Williams won’t tell him! Williams refuses to reveal data that would help admitted students to better judge whether or not attending Williams is a wise decision. Of course, we should do everything we can to alleviate feelings of out-of-placedness among all students at Williams, but we should not pretend that they don’t exist. Moreover, we shouldn’t mislead poor students about the challenges that await them at a place like Williams, especially poor students who we admit with academic credentials significantly below their peers. Seventh installment in a two week discussion of the recent New York Times article “Generation Later, Poor Are Still Rare at Elite Colleges” by Richard Perez-Pena. Interested readers should check out our collection of posts about socio-economic issues related to admissions, from which I have plagiarized extensively. Harvard, Princeton, the University of Virginia and the University of North Carolina at Chapel Hill eliminated early admission programs that were seen as favoring affluent students. First, note that reference to “early admissions programs” in general rather than to Harvard’s early action program specifically. Not all programs provide such an advantages. MIT and Caltech, for example, both offer early admissions programs that provide the same odds of admissions to applicants as they would receive in regular admissions. Applying early to Harvard improves your odds of acceptance. Applying early to MIT does not. Bok’s quote only applies to programs, like Harvard, which as a matter of conscious policy give an advantage to early applicants. Harvard could have kept early action and just made it fair, held early applicants to the same standards as regular applicants. It didn’t do that because its goal is not to be fair. Harvard’s goal is to change the structure of elite admissions. Some colleges stopped including loans in financial aid packages, so that all aid came in the form of grants. Others lowered prices for all but affluent families, not requiring any contribution from parents below a certain income threshold, like $65,000. But the colleges that ended early admissions reinstated them within a few years, after other elite schools declined to follow their lead, putting them at a disadvantage in drawing top students. Moral preening is only really fun if it doesn’t cost you anything. Once it does, it ends. There is almost no chance that Williams will make a change now. It has too much to lose. It also stands the potential of making some non-trivial gains. First, students who, in the past, would have applied early to and gotten accepted by Harvard/Princeton, will now be tempted by early decision at Williams. Isn’t the appeal of having the whole process done by December 15th as great now as it was 25 years ago? Second, those students will need to apply to other schools regular decision, including Williams. Many will be accepted and some will fall in love with Williams. They will end up at Williams because Harvard and Princeton no longer provide an early admissions option. Will either effect be large? Tough to know. But if even 25 kids, who would have gone to H/P, end up at Williams instead, that would be important to the overall quality of the Williams student body. [L]ots of schools have no interest in following Harvard’s lead because EA/ED (early action/early decision) are useful programs (for them). Of course, Harvard doesn’t care what lesser schools do, but if Yale/Stanford/Princeton don’t follow suit, EA will be back in two years. In the end, it took longer than two years, but Harvard re-instated early action just as I foresaw. Harvard can put up with many things, but losing top students to its competitors is not one of them. All of which gives the lie to the moral preening of 2006. Sixth installment in a two week discussion of the recent New York Times article “Generation Later, Poor Are Still Rare at Elite Colleges” by Richard Perez-Pena. Interested readers should check out our collection of posts about socio-economic issues related to admissions, from which I have plagiarized extensively. And, of course, I am sad that Marx is no longer president of Amherst since he seemed well on his way to making Amherst a much less formidable competitor (here and here). But the real sleaze here is Marx and others like him misleading poor students about the actual costs and benefits of elite colleges. But even top private colleges with similar sticker prices differ enormously in net prices, related to how wealthy they are, so a family can find that an elite education is either dauntingly expensive or surprisingly affordable. In 2011-12, net prices paid by families with incomes under $48,000 averaged less than $4,000 at Harvard, which has the nation’s largest endowment, for example, and more than $27,000 at New York University, according to data compiled by the Department of Education. Marx is concerned that poor students go to the NYU website and get scared by the tuition. I, on the other hand, am glad! To a large extent, NYU is a sleazy deal, especially if you are a poor student. The fact that people like Marx won’t even discuss these issues, won’t even mention that not all “fancy colleges” are created equal, makes me angry. If you are poor, and you get in to Harvard (or Williams), then, obviously, you should go. It is free! But borrowing $100,000 (27k times 4 years plus tuition raises) to attend a “fancy college” like NYU is a very, very dicey proposition. Why doesn’t Marx tell poor students the truth? 1) What will the campaign be called? Last one was “The Williams Campaign,” which had the virtue of being descriptive and easy to remember. Nothing wrong with using that name again, but Director of College Relations John Malcolm ’86 was inventive guy back in the day. Maybe he has come up with something better. 3) What will the campaign target be? Last time, the official goal was $400 million, but the final result was $500 million. (Corrections welcome to these or any other data points.) You want a goal that is aggressive, so that people like new Chair of the Board of Trustees Mike Eisenson ’77 write huge (and not just big) checks — and get their friends to do the same. But you also want a goal that you can reach. I hope that the College is aggressive and goes for $1 billion, but more forecast would be for something more like $800 million. Maybe some of our Williamstown residents can provide us with the inside scoop . . .
Fifth installment in a two week discussion of the recent New York Times article “Generation Later, Poor Are Still Rare at Elite Colleges” by Richard Perez-Pena. Interested readers should check out our collection of posts about socio-economic issues related to admissions, from which I have plagiarized extensively. But admissions officers can visit only a small fraction of the nation’s 26,000 high schools, so they rarely see those stellar-but-isolated candidates who need to be encouraged to apply. The top schools that have managed to raise low-income enrollment say that an important factor has been collaborating with some of the nonprofit groups, like QuestBridge and the Posse Foundation, that are devoted to identifying hidden prospects, working with them in high school and connecting them to top colleges. “stellar-but-isolated?” Give me a break. As we reviewed yesterday, the actual number of such students is de minimus, unless you (absurdly) define “stellar” as 1400 math/reading SAT scores. At Williams, scores like that are defined as “below average” for the class as a whole and “rejection worthy” for any applicant without a special attribute, mainly either black/hispanic or athletic tip. Consider Questbridge’s own data. They included 4,773 National College Match Finalists last year. (An impressive number. Questbridge has grown into a big organization in the last decade.) But only 18% of those students had SAT scores above 1400. Still, Questbridge is clearly playing a much larger role in the Williams admissions process. More than 12% (!) of the students admitted in to the class of 2018 were “affiliated” with Questbridge. Does this mean I am against Questbridge? No! I love Questbridge. Any program that, at reasonable cost, brings Williams high quality applicants, especially applicants that might not have known about Williams before, is a good program. Recall our congratulations to Jonathan Wosen ’13 five years ago. Wosen was (is!) exactly the kind of student that Williams needs more of. He went on to succeed at Williams, graduating Phi Beta Kappa. (And I hope he loved his time at the College as well!) If Questbridge can bring us more applicants like Wosen, then Questbridge is worth the money. My complaint is with those who claim that there are thousands and thousands of Jonathan Wosens out there, just waiting to be discovered and brought to Williams. There are a few. And we should try to find them. But having admission officers drive around the country to every below average high school would be a huge waste of time. And, lest you accuse me of stone heartedness, keep in mind that Williams makes very few (any?) visits to the 50% of US high schools with student bodies who average below 1,000 on the Math/Reading SAT. Again, the more AR 1 applicants who apply (and attend!) Williams, the better, whether they be rich or poor. Admissions has a budget and if Questbridge brings us such students at a reasonable price, then we should pay them. But there is a reason that Harvard doesn’t participate in Questbridge, and it isn’t because they lack the money to do so . . . or an interest in applicants like Jonathan Wosen. Fourth installment in a two week discussion of the recent New York Times article “Generation Later, Poor Are Still Rare at Elite Colleges” by Richard Perez-Pena. Interested readers should check out our collection of posts about socio-economic issues related to admissions, from which I have plagiarized extensively. Since when did every college president decide that coolness requires three names? Cappy Hill, or in more formal settings, Catharine Hill, was happily associated with Williams for 20+ years without anyone ever using her middle name. But now we have to include “Bond?” Weird. And Morty Schapiro seemed to do the same for a while, with his regular reminders that his middle name is Owen. Anyway, back to the article . . . In other words, lots of the students (SAT 1420 to 1450) that Hill describes as “high ability” are pretty much automatic rejects at Williams (leaving aside whatever affirmative action Williams places on socio-ec diversity). Moreover, lots of the other students with SAT >= 1450 lack the grades and other scores that put them in AR 2. So, Hill is (purposely?) overestimating the pool of potential applicants. Second, even such high ability applicants are not (meaningfully) under-represented! Hill reports that these high ability, low income students make up 10% of elite schools but 12.8% of the population. Not a big enough difference to get worked up about, I think. And certainly not enough to make me think that the returns to more “outreach” are particularly high. Third, Hill does not control for the desires of the students. Imagine two students in Georgia, both with Academic Rating 1 (on the Williams scale), both admitted to Williams and to the University of Georgia. Both won free rides at UGA via merit scholarships. One is student is poor and one is rich. I bet that the the poor student is much more likely to choose UGA. This preference, alone, might be enough to explain why poor students are slightly under-represented at elite schools. Fourth, Hill does not seem to recognize that a poor student, even if as academically accomplished as the rich student, might be better off at an (excellent) state school rather than a (2nd tier?) liberal arts college like Vassar. Leave the details of this debate for another day, but it is indicative of the attitude of people like Hill that they would, in most cases, think that a student choosing UGA over Vassar is making a mistake. Third installment in our two week discussion of the recent New York Times article “Generation Later, Poor Are Still Rare at Elite Colleges” by Richard Perez-Pena. Interested readers should check out our collection of posts about socio-economic issues related to admissions, from which I have plagiarized extensively. But critics contend that on the whole, elite colleges are too worried about harming their finances and rankings to match their rhetoric about wanting economic diversity with action. Kahlenberg has had a nice career regurgitating the Cathedral’s wisdom and making himself available to New York Times reporters. Unfortunately, he has been very wrong about several important items in his area of (alleged) expertise. First, his initial claim to fame was to propose affirmative action based on class as a replacement for affirmative action based on race. Alas, he lacked the social science chops to understand that the massive number of poor, but academically successful, Asian Americans meant that, were a place like Williams to use class instead of race, its proportion of African American students would go toward zero very quickly. In fact, for virtually every African American student who enrolls at Williams then are 10 (100? 1000?) or more Asian Americans who come from poorer families but had better high school records. In the 80’s, there were 500 academically accomplished students per class. Judging/guessing from what we see at reunions, the total number of children of a typical class is at least 500. But only 75 or so find spots at Williams! Do the other 425 go to Stanford? Nope. And the same harsh mathematics apply to the children of other elite schools. Since smart people have smart children, the pool of legacies that the College has to choose from is very impressive. So, it does not need to meaningfully lower standards to find 75 good ones. What happens if low-income students start calling the bluff of selective universities, and do start applying in much larger numbers? It all depends on which sort of low-income students we are talking about. If 10,000 poor kids with lousy SAT scores and bad high school grades were to apply to Williams, then Williams would reject them all, just as it rejects thousands of rich kids with poor scores/grades. If lots of poor students with amazing scores/grades started applying, then Williams would accept them, as would other elite colleges. But the truth, which Kahlenberg either doesn’t know or is too slippery to admit, is that the main issue is poor students with less impressive academic credentials than the non-poor students Williams currently admits/enrolls. If Williams has to choose between poor kids with 1350 SAT scores and rich kids with 1550 (and similar differences in high school grades), then it will (should!) choose the rich kids. If it doesn’t, it won’t be an elite school for long. No bluff calling is required. Second installment in a two week discussion of the recent New York Times article “Generation Later, Poor Are Still Rare at Elite Colleges” by Richard Perez-Pena. Interested readers should check out our collection of posts about socio-economic issues related to admissions, from which I have plagiarized extensively. Getting low-income students onto elite campuses is seen as a vital engine of social mobility. People like Carnevale don’t seem to think clearly about the empirical claims that they are making. Imagine a perfect world, one without nasty institutions, like Williams, “reinforcing advantage,” a world in which every child is treated exactly the same. Is there correlation between parent and child outcomes in this world? Of course there is! Consider basketball and height. Tall people have a huge advantage in playing basketball and height is around 70% genetic. So, even in a world in which every child has free basketball lessons from birth, success in basketball — whether measured as relative ability in 8th grade gym class or starting in the NBA — will be passed “on through generations” because of genetics. NBA players will be much more likely to come from families in which parents were in the top 10% of basketball ability because a major component of success is genetic. In fact, the more that you equalize environment, the greater the relative importance of genes. In a parallel fashion, the things that make you successful as a high school student — intelligence, hard work and conformity — are the same things that help you to earn a high income. And these traits have a genetic component as well. So, even in a world with perfect equality in terms of child-rearing, parents with high income (meaning, on average, hard-working, intelligent, conformist parents) will have successful students because these traits have a genetic component. Now, it is certainly the case that parents, and institutions, have an effect beyond their genetics, but by failing to even discuss (or understand?) the genetic component of inherited success, Carnevale and others make it hard to take their claims seriously. First installment in a two week discussion of the recent New York Times article “Generation Later, Poor Are Still Rare at Elite Colleges” by Richard Perez-Pena. Interested readers should check out our collection of posts about socio-economic issues related to admissions, from which I have plagiarized extensively. Why two weeks? Because my little bother, Stephen Field ’37, thinks this is a topic worth discussing in depth! As the shaded quadrangles of the nation’s elite campuses stir to life for the start of the academic year, they remain bastions of privilege. Amid promises to admit more poor students, top colleges educate roughly the same percentage of them as they did a generation ago. This is despite the fact that there are many high school seniors from low-income homes with top grades and scores: twice the percentage in the general population as at elite colleges. First, always begin by asking “What is the New York Times choosing not to write about?” In this context, the answer is: All the other metrics that 18 year-olds (and their families) differ on but which colleges, and the New York Times, don’t care about. For example, I would bet that high school students with parents that served in the military or scored about average on their SATs or currently attend Baptists congregations or are divorced are dramatically less likely than other students to apply to, be accepted by, or attend elite colleges. Does the Cathedral care? No. The Cathedral — elite academia and the prestige press — cares about race and money and gender, and maybe a few other things. Being the son of a divorced Baptist veteran of average intelligence counts for nothing, no matter how few of you there are at Williams. Second, read the whole article. Note how constricted the range of views are: running from the left to the far left. No one who thinks, as I do — that there is nothing surprising in the under-representation of poor students, that there is little that could plausibly be done about it and that attempts to do anything are just as likely to hurt as to help — is interviewed. Does Perez-Pena know that we are out here? Does he care? Or does he view his job as weaving a cushy cocoon of ignorance for Times readers? You don’t have to agree with, say, Charles Murray or Bryan Caplan, to think that a news article ought to mention that they exist. Ten to 15 years ago, when some elite colleges got more serious about economic diversity, there was a view that increasing financial aid could turn the dial, but “I think we were a little naïve,” said Morton O. Schapiro, president of Northwestern University, a former president of Williams College and, like Dr. Hill at Vassar, an economist specializing in the economics of higher education. People who see tilts and other injustices in elite admissions have a highly naive view of the possibilities once a student hits 17. These modern day Marxists have a (stupid) a priori belief that the abilities which lead to academic success at Amherst are uniformly distributed across the population. Alas, these abilities — high IQ, a love of learning, disciplined work habits — are very non-uniformly distributed. The children of people in the top half of the income distribution are much more likely to have these abilities than the children of people in the bottom half. This effect is magnified in the top and bottom income deciles. Smart people have smart children because intelligence like height is largely inherited. People who love learning have children who love learning because they teach them to do the same, both directly and via example. You can bet that children who are read to by their parents each day are much more likely to end up at Amherst than children who are not so fortunate. Hard-working people have hard-working children because these parents make their children work hard, thereby teaching them the value of hard work, of ambition and striving. Now, it turns out that high IQ, a love of learning and hard work — for shorthand, let’s call these attributes “merit” — are also correlated with wealth. Or, rather, it is unlikely that someone blessed with these three attributes will end up in the bottom 25% of the income distribution. But people like Marx seem blind to this reality. They really want to believe that there are thousands of undiscovered gems lying in the bottom income quartile, just waiting for open-minded souls (like Marx) to discover them and, Professor Higgins-like, transform them into polished stones. Tony Marx was the president of Amherst at the time. He, and other naifs like Morty and Cappy Hill ’76, thought that they could meaningfully increase the percentage of poor students at places like Williams without meaningfully decreasing the quality of the student body. Alas, you can’t. It isn’t a “psychology and sociology thing”, much less a “pricing thing.” It is a reality thing. If you are upset that I haven’t provided enough evidence for these claims, have no worries! I have nine more days of posts all queued up . . . In case it disappears from the web, the entire article is below the break. Some have quibbled with Pinker’s assertion that only 5 or 10% of the Harvard class is chosen with academic merit as the sole criterion. They note the overall high scores of Harvard students as evidence against this claim. But a simple calculation makes it obvious that the top 2000 or so high school seniors (including international students, who would eagerly attend Harvard if given the opportunity), ranked by brainpower alone, would be much stronger intellectually than the typical student admitted to Harvard today. First, it is somewhat rude of Hsu to use the phrasing “some” when I (I think) have been the only one to make this argument explicitly. Second, by “quibbled,” I think Hsu means “demonstrated.” Where, exactly, is the flaw in the argument? A 1590 Math/Reading SAT score is far into the 99th percentile (pdf). (Exactly how far is unclear to me.) Here (pdf) is data from 2008 that uses all three sections and here (pdf) from 2013. The total number of perfect scores is in the hundreds not thousands. I realize that I am playing fast and loose here, that I began by looking at Math + Reading, that these tables use all three sections and that summing percentiles is not the same as looking at the percentiles of the distribution of summed scores. But the basic numbers make clear that there are not nearly as many high scoring students at Hsu naively assumes. Imagine that the height of the 75th percentile male student at Harvard were in the 99th percentile of the overall distribution. That would be about 6’4”. If 1/4 of the men at Harvard were above 6’4” would you doubt that height was the central factor in admissions? There is no way to get so many tall men if you are selecting on other factors that are not heavily correlated with height. There are not 2,000 high schools students that are much stronger than the typical Harvard student, there are 200. And someone has to go to Yale! Fourth, Hsu uses phrases like “ranked by brainpower alone” (by which he means a heavily g-loaded IQ test) and implies that this is the same thing that we (me and Pinker) are talking about when we discuss “academic merit.” But it isn’t. “Academic merit” means the highest grades in the most rigorous high school classes along with top teacher recommendations and extreme standardized test scores. This is what Harvard (and Williams) care about. You can be a genius but, if you blow off high school classes that you find boring and stupid, Harvard/Williams don’t want you. The central issue here is not: What should Harvard/Williams select for? (I expect that Hsu and I would see eye-to-eye on that.) The issue is: What do Harvard/Williams select for? I am trying to explain that Harvard/Williams do not care nearly as much about “extracurricular” activities — at least things like “the arts, charity, activism, travel” — as Pinker/Rasmusen/Hsu think they do. The data demonstrate this because there is no way for Harvard to have such extreme SAT scores and, simultaneously, place much/any emphasis on these other factors. If it did, then, almost by definition, the SAT score distribution would be shifted lower. To be concrete: Harvard admitted 2,000 high school students out of the 35,000 who applied last year. Imagine that we kept fixed the things that I say matter (academic merit, race, wealth and recruited athlete status) and randomize the things that Pinker/Hsu think matter (arts, charity, activism, travel). That is, Applicant X keeps the attributes that I assert Harvard cares about but then is randomly assigned the extracurricular activities of some other applicant. How different would the admissions decisions be? Almost indistinguishable! Harvard would let is at least 1,500, and probably more like 1,900 of the 2,000 students it did, in fact, admit even if they were assigned a random set of extracurricular activities from among the pool of applicants, and for all the reasons that I gave in my previous post. These facts turn Pinker’s claim on its head. It is not 5% of the class that is selected on the basis of academic merit. It is 5% that is selected on something other than academic merit, once we control for race/wealth/athletics. Division 1a caliber athletes: Harvard (12%) and Caltech (<1% ?) I lack the energy/data to go through the argument that these factors alone explain the differences in the 25th percentile but they almost certainly do. But, before going further, can we at least agree that I have demonstrated that, at least for 25% of the class, Harvard is at least as focused on “academic merit” as Caltech is? In other words, Pinker’s estimate of 5% or 10% is off by at least a factor of 2.5 to 5. Once we agree on that, we can move on to other portions of the score distribution. Keefe, Bruyette and Woods, a stock brokerage and an investment bank, occupied three floors of the South Tower of the World Trade Center on the morning of September 11, 2001. Lindsay S. Morehouse ’00, a new research assistant, was working on the 89th floor when American Airlines Flight 11 struck the North Tower at 8:46 AM. As The 9-11 Commission Report describes in chilling detail, there was little consensus about what denizens of the South Tower should do. Howard Kestenbaum ’67 and others started to leave the building. Lindsay Morehouse did not. She and her co-workers did not know — they could not know — that United Airlines Flight 175 was only minutes away from impact. They stayed were they were. Flight 175 struck the South Tower at 9:03, crashing in between floors 78 and 84. Lindsay was just 5 floors above. She, and hundreds of others, survived the impact. They did not know — they could not know — that the South Tower would collapse in less than one hour. Even five years later, the bits and pieces of a life well-lived and yet unfinished remain..
On September 10, a dream came true for Lindsay Morehouse, an investment banker with Keefe, Bruyette and Woods. She was accepted as a volunteer at Big Brothers and Big Sisters of New York and eagerly awaited the name of her new little sister. A college tennis star who led the Williams College women’s team to the NCAA finals in her junior year, she continually sought challenges and new adventures. Only 24 years old, she had already visited New Zealand, France, Italy, New Mexico and Greece. She had been bungy-jumping and rock-climbing. She was famous among her huge circle of friends, teammates, colleagues and loved ones for her intensity and deep feelings, for being as demanding of herself as she was of each relationship in her life. Her passions were varied: gnocchi and Indian food, “Rent” and “Les Miserable,” the Yankees and kittens. It seemed that every time she touched a life, she made a life-long friend, as witnessed by the crowd of more than 800 mourners at her memorial service on September 15. Lindsay had come to Williams from St. Paul’s School. Her love of tennis and academic seriousness were clear even then. Mrs. Maycen also talked about her daughter’s affection for St. Paul’s School and how the scholarship in her name honors Lindsay’s feelings toward the School. Lindsay’s mother said that she believes her daughter would be honored to know that a scholarship in her name would provide individuals with leadership potential an opportunity to come to St. Paul’s, and to take full advantage of all the School has to offer; much like Lindsay did herself. “I just know that, from her perch above, Lindsay is pleased, proud, and humbled to have a scholarship in her name at the school she loved so well,” said Mrs. Maycen. This was the last question that Lindsay’s father was to hear from his daughter, the last time that he would listen to her voice, the last chance that he would have to try to protect her from a too cruel world. Yet there was little he could do. Morehouse called her father after the first plane hit the other tower to say that she was safe and that she had been instructed to stay in the building. She called a second time after the second plane hit her tower. That call was cut off. And that was all. Lindsay, like more than 1/3 of the employees of Keefe, Bruyette and Woods, died that day. Neither fathers nor mothers, husbands nor wives, brothers nor sisters could save them. Although the most important tragedy of 9/11 is the deaths of thousands of innocents like Lindsay Morehouse — thousands of people who gave more to life, and had more left to give, than we can ever fully know — the rest of us must shoulder the burden of survival, of wondering what we might have done differently to save them, of worrying about the telephone call which might come to us someday. I do not dread asking this question. I dread trying to answer it. Lindsay Morehouse was not just one man’s daughter. She was a daughter to all of us. May my own daughters be spared her fate. 1) Every time that Williams appears in a headline like this with Princeton, the value of the Williams brand improves. It is very important that we maintain this #1 ranking, mainly for admissions, and especially for international students. 2) Kudos to Adam Falk (and everyone else at Williams) for making this happen. US News can be tricky about its methodology and the changes it makes from year-to-year. They would sell more magazines if there were more changes in the top, so maintaining a #1 ranking can be tricky. 3) As I mention each year, there is a great senior thesis to be written about the rankings, similar to this article on the US News law school rankings. If you write such a thesis, hundreds of people around the country will read it. We need to dive into the details. How far in the lead is Williams and what do we need to do to maintain the lead? 5) Recall my predictions from 5 years ago. Although the competition is tough, our most serious competitor is Amherst and they will face real headwinds given their financial constraints. Their endowment is in more trouble than ours. Their increase in enrollment will hurt the student:faculty ratio. 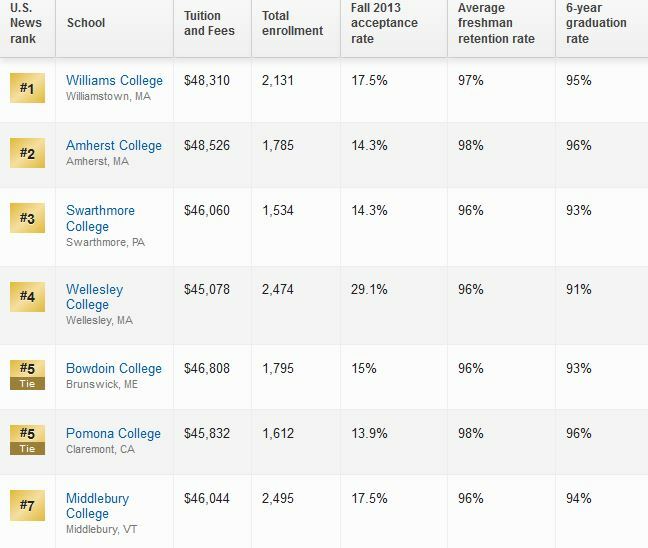 These ranks are based on data from before the financial crash, so the Williams advantage over Amherst will only continue. Don’t be surprised if/when Amherst falls behind Swarthmore in a year or two. I also suspect that Middlebury’s recent (and deserved) rise may be in danger. Amherst hasn’t caught us, as predicted, and Middlebury has fallen from 4th to 7th. I still think that Amherst is in danger of falling behind Swarthmore, but we need more detailed data to evaluate that. 6) Below the break are the details of the methodology, which I am saving here for historical purposes. Steven Pinker’s essay in The New Republic (hat tip Razib Kahn) provides a false description of admissions at places like Harvard and Williams. At the admissions end, it’s common knowledge that Harvard selects at most 10 percent (some say 5 percent) of its students on the basis of academic merit. … The rest are selected “holistically,” based also on participation in athletics, the arts, charity, activism, travel, and, we inferred (Not in front of the children! ), race, donations, and legacy status (since anything can be hidden behind the holistic fig leaf). First, leave aside athletics for the moment; the preferences there are real and large. A difference of 50 or 60 points may seem small, but this is (back-of-the-envelope) 1/4 to 1/3 a standard deviation. ** If we were talking about height, it would be as if the average student at Harvard were an inch or so taller than the average student at Williams or Cornell. There is no way, in a large population, to get this sort of difference unless the selection procedure has a major focus on SAT scores (or their correlates). In particular, there is no way that the top 25% (!) of the Harvard class has almost perfect SAT scores if only 10% (much less 5%!) is selected on the “basis of academic merit.” It is mathematically impossible. Third, there are no meaningful preferences given for “the arts, charity, activism, travel” and other non-academic, non-sport reasons. Why? Harvard is not that different from Williams and, as Professor of Music David Kechley explained 11 (!) years ago, there is no meaningful preference given for musical talent. There is no need to give preference for things like music and art because academically strong students are often talented in music and art. Go meet some! Even if you wanted to give preference to those students who would go on to be heavily involved in things like, say, student government and charitable work, there is no way for the admissions department to predict which students will do so, as Jen Doleac ’03 demonstrated in her thesis. Harvard does not have the time or money to meaningfully evaluate the artistic ability of applicants. With 14,000 applicants, the logistics are impossible. As books like The Gatekeepers and A is for Admission make clear, admissions officers make some notes about non-academic talents, but these attributes play a de minimus role in the process. “Travel?” Harvard prefers students who have done a grand tour of Europe? Give me a break! The biggest thing that teenage travel correlates with is family income, and Harvard gets plenty of rich kids already. Might Pinker be able to point to Harvard students who traveled a lot? Sure! But he could also find plenty of blond Harvard students. That fact doesn’t mean that the Admissions Office selects by hair color. Now, every once in a while does something like music help? Sure! If the orchestra conductor calls up the admissions office and begs for some decent drummers, he may get helped out. But, overwhelming, even those drummers will have amazing academic credentials. Fourth, even affirmative action does not change the basic story because black (and Hispanic) applicants are accepted under the same criteria as white/Asian students. The same process of looking at high school grades, course schedule, teacher comments and standardized test scores applies to everyone. Whatever it is that Harvard is looking for in white/Asian students, it is looking for the exact same thing in black/Hispanic students. Harvard just sets the bar lower for the latter. Being poor is probably an advantage. Being a non-US citizen is probably a disadvantage. But, whatever bucket you are competing in, the key criteria is academic success. Fifth, legacy is a red herring. Do the math! There are 1,600 Harvard students in the class of 2018. There were around (I think) 1,600 Harvard students in each class in the 80’s. I can’t find good data on fecundity, but, judging from Williams, elite students from the 80’s go on to, at least, achieve replacement levels of fertility. So, there are 1,600 or so legacy students born in 1995/1996 who would love to come to Harvard (or at least be accepted by Harvard) for the class of 2018. But Harvard only enrolls about 200 of them! *** You think the other 1,400 go to Stanford? Ha! It is easy for Harvard, like Williams, to ensure that enrolled legacy students are academically equivalent to non-legacy students because the legacy pool is so strong. Turns out that Harvard parents tend to have academically talented children. Who knew? Sixth, even in the case of athletics, academics matter because the admissions department insists. See here for some details. But, to the extent that Pinker has a point, he is correct that athletics plays an important part. And so does major wealth. But even if we combine the athletes and the donors, we are still talking about less than 20% of the class. Big picture, Pinker’s description of Harvard admissions is fundamentally flawed because the vast majority of it (80%?) is, in fact, driven by “academic merit.” Unless you are a recruited varsity athlete or a billionaire’s child, you got in because your classes/grades/scores were better than the other applicants (at least within your race and/or socioeconomic class and/or nationality). And this is easy to see if you follow the admissions process at your local high school, assuming it is the sort of school that sends lots of students to elite schools. On average, the high school students who get into Harvard have done better — higher grades in tougher classes with better teaching recommendations and standardized test scores — than the students who get into Williams, and then the same down the academic pecking order. Steven Pinker is a voice of reason in many of the debates surrounding higher education. It is too bad that he is so misleading about Harvard admissions in this essay. * Of course, it is not clear what scale Pinker is using for his 5% or what scale we should be using for our 80%. The main clarification that applies to the 80% is that, although the academic evaluation system is the same across categories of students, students are mostly competing against peers in their own racial, citizenship, and socio-economic bucket. If you are, say, rich and black, then Harvard admits use on the basis of academic merit in comparison with other rich/black applicants. ** Yes, I realize that this is a rough estimate. The standard deviation of individual SAT tests is around 100. I can’t find good estimates of the standard deviation of combined scores. If the scores from the two tests were uncorrelated, then the combined standard deviation would be around 141. But the positive correlation means that this is a lower bound. And, of course, we are talking about the far right tail of the distribution, where all sorts of weird stuff might happen. The larger point stands: it is impossible for Harvard’s combined SAT scores to be 50+ points higher than Williams/Cornell, year after year, without significant focus on SAT scores by the Admissions Department. *** See our legacy admissions category for various calculations with regard to Williams. I doubt that things are much different at Harvard or any other elite school. Why would they be? Martha Coakley ’75, EphBlog’s favorite gubernatorial candidate, has some lobbyist issues. A politically wired Beacon Hill lobbying firm let off with a light penalty by Democratic gubernatorial hopeful Martha Coakley for a possible violation of state law hosted a fundraiser for Coakley’s U.S. Senate campaign in 2009, the Herald has learned. The fundraiser calls into question the attorney general’s repeated attempts to distance herself from the lobbying powerhouse, which negotiated a controversial settlement with Coakley’s office for allegedly charging illegal contingency fees to the Franciscan Hospital for Children. Coakley’s campaign finally acknowledged to the Herald that the Brennan Group hosted the November 2009 fundraiser for her 2010 Senate campaign after repeatedly denying the firm gave any money to her gubernatorial bid. Ho, hum. Elections cost money and some of the biggest givers will always be those who want to get something out of the government. The larger and more powerful the government becomes, the more intensely will people seek out fixers like Brennan. The Brennan Group is a politically connected firm whose clients include the MBTA Retirement Fund, Delaware North and Tufts Veterinary School. Brennan is a former Democratic lawmaker, and he and his staffers have donated tens of thousands to a slew of politicians, mostly fellow Democrats. Ha! Life is often more absurd than any satire. The first piece of advice is the most widely discussed in journalism circles — get good with numbers. The old ‘story accompanied by a chart’ was merely data next to journalism; increasingly, the data is the journalism. Nate Silver has changed our sense of political prediction. ProPublica has tied databases to storytelling better than anyone in the country. Homicide Watch can report more murders (all of them, in fact), using fewer people, than the Washington Post. Learning to code is the gold standard, but even taking an online class in statistics and getting good at Google spreadsheets will help. Anything you can do to make yourself more familiar with finding, understanding, and presenting data will set you apart from people you’ll be competing with, whether to keep your current job or get a new one. Exactly correct. The Williams statistics major is a good place to start. Even better, start using data in your Record reporting. For example, how about an update on grade inflation at Williams? There was no Mountain Day from after WW II that I know of and there wasn’t one for sure from 1956-1960. When I returned to Williams in 1968 there still was no Mt. Day. When Ralph Townsend retired in 1983-4 I took over the Outing Club and resurrected Mt. Day and suggested to President Chandler that we ring the bells one morning and give all the students a day off from classes like in the early part of the century, and we head for the Mountains. He rejected this idea as did President Oakley. So we had Mt. day on a Saturday or Sunday in October. We had hikes to various places with cider and donuts, several times going to the top of Greylock with various members of the Faculty leading the hikes especially the Geology Department. Some years we did trail work in the mornings and hiked to some peak in the afternoon. It took a couple of years to figure out that it was more fun to have all the hikes to end at the same place. This we did in the late 80’s. When Morty Shapiro became President he put Mountain Day on the calender and it was to be one of three Fridays in October. Now, the Bells are sounded and classes are off with Outing Club planning the days activities. (Actually the internet is more important than the Chapel Bells). Scott Lewis can fill you in on what happened during his era as director of the Outing Club and when the change took place from a weekend day to a day off of classes on one of the October Fridays. Apparently, there was a big fight in the faculty about the idea of canceling a day of classes for Mountain Day. When was that? Who were the heroes and who the villains? A year ago, I wrote a column called “Graduate School in the Humanities: Just Don’t Go,” advising students that grad school is a bad idea unless they have no need to earn a living for themselves or anyone else, they are rich or connected (or partnered with someone who is), or they are earning a credential for a job they already hold. The main point of another column I wrote six years ago (“If You Must Go”) is that students considering graduate school should “do their homework.” But the problem is that there is still almost no way—apart from the rumor mill to which they do not really have access—for students to gather some of the most crucial information about graduate programs: the rate of attrition, the average amount of debt at graduation, and, most important, the placement of graduates (differentiating between adjunct, lecturer, visiting, tenure-track positions, and nonacademic positions). Programs often claim that graduates who are working as adjuncts or visiting faculty members are successfully placed in the profession. Most departments will never willingly provide that information because it is radically against their interest to do so. I can see no way for that information to become available unless it becomes part of accreditation or rankings in publications such as U.S. News and World Report. Perhaps departments might start offering details if students started demanding it in large numbers, with support from organizations such as the American Association of University Professors. Maybe it’s possible for graduate students themselves to start gathering and reporting this information on a Web site. Graduate school may be about the “disinterested pursuit of learning” for some privileged people. But for most of us, graduate school in the humanities is about the implicit promise of the life of a middle-class professional, about being respected, about not hating your job and wasting your life. That dream is long gone in academe for almost everyone entering it now. If you are in one of the lucky categories that benefit from the Big Lie, you will probably continue to offer the attractions of that life to vulnerable students who are trained from birth to trust you, their teacher. Graduate school in the humanities is a trap. It is designed that way. It is structurally based on limiting the options of students and socializing them into believing that it is shameful to abandon “the life of the mind.” That’s why most graduate programs resist reducing the numbers of admitted students or providing them with skills and networks that could enable them to do anything but join the ever-growing ranks of impoverished, demoralized, and damaged graduate students and adjuncts for whom most of academe denies any responsibility. Related discussion here. Read the whole thing. Do Williams professors tell their undergraduate students this harsh truth, a truth that is becoming more and more true in the social and natural sciences as well? I hope so. But, from an institutional point of view, the more interesting case is the Masters Program in Art History. Does Williams tell students interested in the that program about “the rate of attrition, the average amount of debt at graduation, and, most important, the placement of graduates (differentiating between adjunct, lecturer, visiting, tenure-track positions, and nonacademic positions).” I doubt it. Perhaps we should crowdsource some of that data? Below the fold are the Masters in Art History graduates of 2000. Where are they now? Fall classes start on Thursday. What courses should you take? See our previous discussions. ANTH 328: Emotions and the Self with Peter Just. This is available for first years. Too many first years take a big intro class because they think they “should.” They shouldn’t! Even a “bad” tutorial at Williams is better than almost all intro courses. HIST 140: Fin-de-Siècle Russia: Cultural Splendor, Imperial Decay with Bill Wagner, former Williams president. It does not matter if you care about Russia. As always, choose the professor, not the class. If you are a first year and you don’t take a tutorial like this, you are doing it wrong. BIOL 405: Sociobiology with Manuel Morales. Even though this course, in theory, is more junior/senior biology majors, I bet that Morales would let you in if he has space. Assuming you had a decent biology class in high school, you won’t need any other prerequisite. 2) STAT 201 (if you enter Williams with Math/Reading SAT scores below 1400, you might start with STAT 101). No topic is more helpful in starting your career, no matter your area of interest, than statistics. Students who take several statistics courses are much more likely to get the best summer internships and jobs after Williams. Also, the new Statistics major looks amazing. 3) CSCI 136 (if you enter Williams with Math/Reading SAT scores below 1400, you might start with CSCI 134). Being able to get the computer to do what you want it to do is much more important, to your future career, than most things, including, for example, the ability to write well. 4) PHIL 222: Minds, Brains, and Intelligent Behavior: An Introduction to Cognitive Science with Joe Cruz, former EphBlogger and all around great guy. And don’t worry about the silly prerequisites. Just tell Joe that EphBlog sent you! What courses would you recommend? What was the best class you took at Williams? Wish that I had been invited to this party! EphBlog is powered by WordPress and delivered to you in 1.529 seconds using 35 queries..